The highly concentrated copper chlorophyll, a stabilized type of chlorophyll, in Evergreen combines the nourishing aspects of green, leafy vegetables with the hydrating power of water to address the body’s circulatory and digestive systems. The key ingredient is copper chlorophyllin which helps the circulatory system, helps clean the intestines and aids digestion. 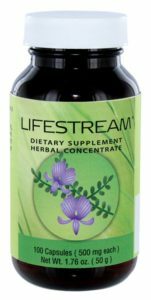 Highly concentrated chlorophyll that addresses the digestive and circulatory systems. important source of essential enzymes and vitamins. receive the many nourishing benefits. 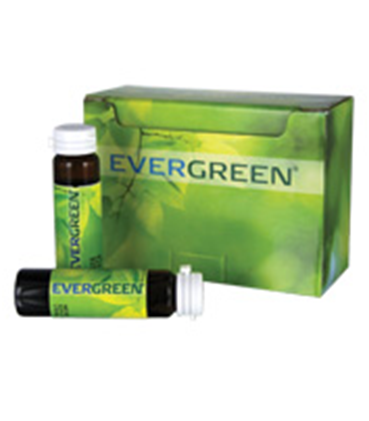 Evergreen is available in a box of 10 vials. Chlorophyllin, peppermint oil, zinc amino acid chelate, iron amino acid chelate.. I am not an ultar marathoner, but within the last 5-6 years I have challenged myself to sign up for a half marathon a year so I have a goal to work toward during those hard winter months. 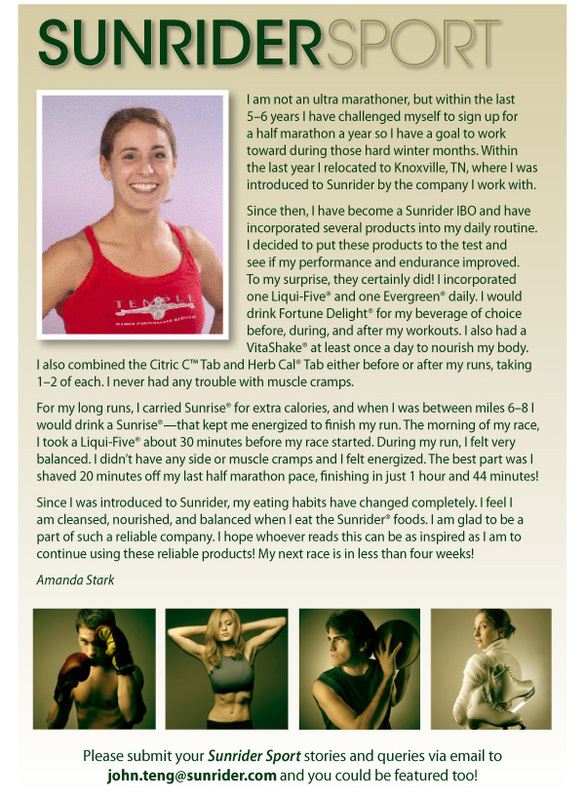 Within the last year I relocated to knowxville, TN, where I was introduced to Sunrider by the company I work with. Since then, I have become a Sunrider IBO and have incorporated several products into my daily routine. I decided to put these products to the test and see if my performance and endurance improved. To my surprise, they certainly did! I incorporated one Liqui-Five and one Evergreen Daily. I would drink Fortune Delight for my beverage of choice before, during, and after my workouts. I also had a VitaShake at least once a day to nourish my body. I also combined the Citric C Tab and Herb Cal Tab either before or after my runs, Taking 1-2 of each. I never had any trouble with muscle cramps. For my long runs, I carried Sunrise for extra calories, and when I was between miles 6-8 I would drink a Sunrise-that kept me energized to finish my run. During my run, I felt very balanced. I didn’t have any side or muscle cramps and I felt energized. The best part was I shaved 20 minutes off my last half marathon pace, finishing in just 1 hour and 44 minutes! Since I was introduced to Sunrider, my eating habits have changed completely. 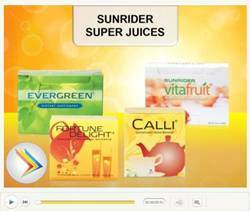 I feel I am cleansed, nourished, and balanced when I eat the Sunrider foods. I am glad to be a Part of such a reliable company. I hope whoever reads this can be as inspired as I am to continue using these reliable products! My next race is in less then four weeks! Be the first to review “EVERGREEN” Click here to cancel reply.